‘Big Duck Gold’ has very large golden-yellow flowers that continue blooming throughout the season, much longer than the comparisons. 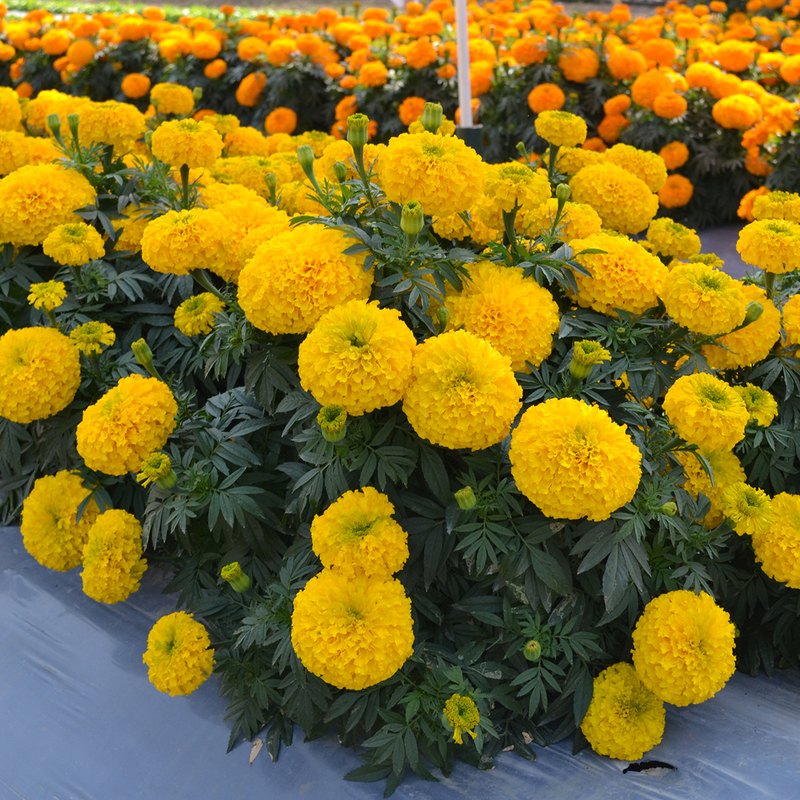 These marigolds begin the season putting energy into establishing a solid, healthy plant with clean, deep-green foliage. Full, large blooms top the 15” plants, which are slightly taller than the more compact comparison varieties. They continue blooming through the end of the season. These marigolds can be planted everywhere: in beds, containers; in landscapes as mini hedges, back of the border plants or even as a filler in perennial beds. The last nasturtium AAS Winner was back in the early days, in the 1930s. Now it is time to introduce a wonderful rose-colored nasturtium perfect for today’s gardens. ‘Baby Rose’ is a petite-flowered, mounding variety with healthy, dark foliage ideal for containers and small space gardens. AAS expert judges praised the uniformly compact plants that have flowers with consistent coloration. Their compact habit means less “flower flopping” with their blooms remaining upright throughout the season. The rose color is uncommon in nasturtiums and contrasts beautifully with the dark-green foliage. An added bonus, both the leaves and flowers are edible. This newest color of the popular Wave petunias was one of the highest-scoring plants in last year’s trials. AAS judges enthusiastically came up with an array of ways to describe the unique carmine rose color: “Fabulous,” “Stunning,” “Intense,” “Vibrant,” “Lively,” “Bright,” “Non-fading,” “Outstanding,” to name a few. Large 2” flowers literally cover the easy-care spreading plants that rarely need deadheading because new blooms continuously pop up and cover the spent blooms. ‘Wave Carmine Velour’ is an excellent performer and does equally as well in containers or hanging baskets as it does in the landscape.